Are you restricted to the font you can use? We can convert a great deal, if not most fonts, into neon. What is single, double and triple line neon? Single Line neon is when the tube follows the centre line of the letter, double line neon is where the outside edge of the letter shape is followed, triple line is a combination of the both. We can do more lines as long as space allows. Can you make my logo into a neon sign? We can convert almost all logos into a neon sign. The more intricate the logo the larger the final sign will need to be. What is the largest you can make a neon sign? We are capable of making neon signs of any height, this would only be restricted by access equipment capabilities. What is the smallest letter height? The minimum height of the lettering we can manufacture is dependent on the diameter of glass we will be using for the sign. If we manufacture your sign in 8mm glass, which has limited colours, we can do as small as a 40-50mm letter height, in 10mm glass you would be looking at a height around 80-90mm, depending on the font style. Is there a limit to the neon colours available? There is but we have a wide range of colours that can be viewed on our Colour Selector Page. Can my sign be used indoors and outdoors? We can manufacture your sign for either use, however if it is designed for indoor use it should not be used outside. What can I have my neon sign mounted on? When it comes to the mounting of your sign, you have several options available to you, this includes mounting directly to a wall of your choosing, wood, metal, Aluminium composite or acrylic. If you have another type of material in mind, run it past us and we will let you know if we think it can be done. 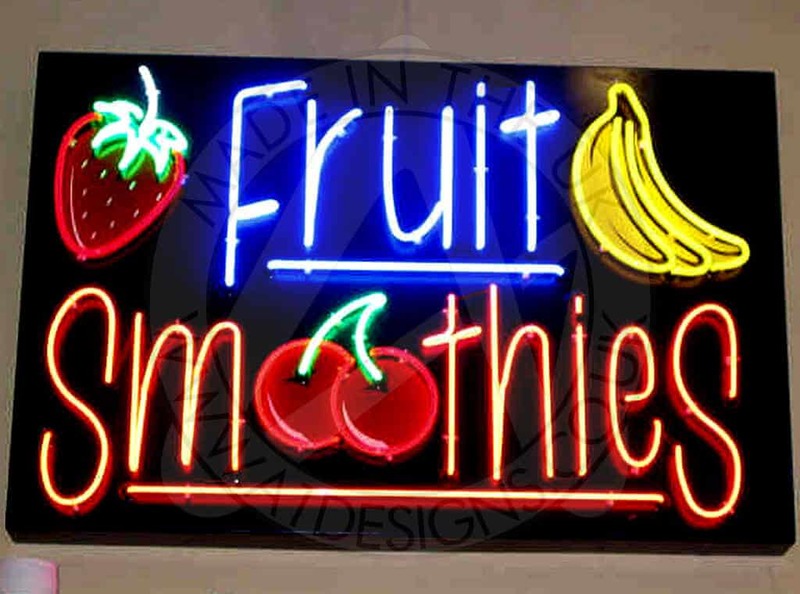 What is the difference between an external and internal neon sign? An internal neon sign uses different control gear to an external neon sign; the internal neon sign control gear is smaller and needs to be located close to the sign; the external control gear can be used inside as well as outside it is larger in size, but can be located remote to the neon sign or neon art installation. 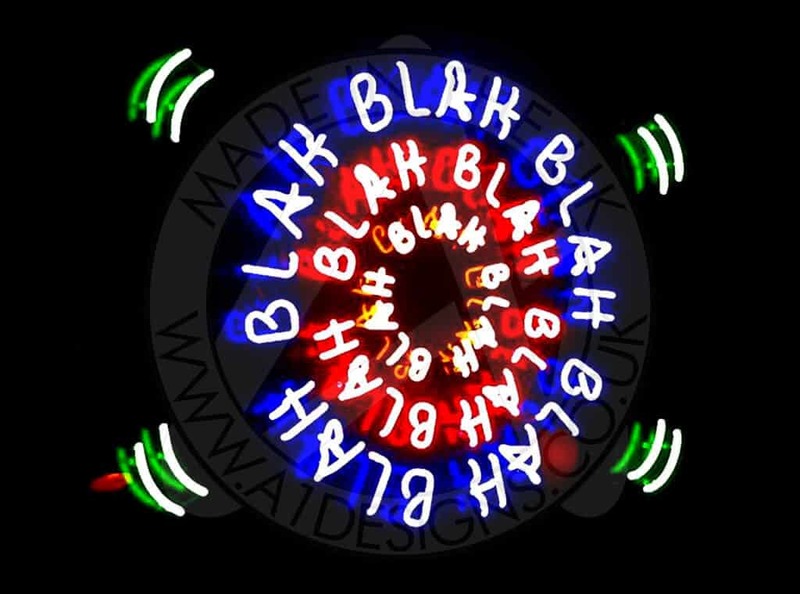 Does my neon sign or neon art require an isolator/fireman’s switch? If your neon sign is portable, can be unplugged and carried out the building no fireman’s switch is required, also if the sign is fixed and pulls 100w or less of power and is fed from a readily available socket one is not required. Why does my neon sign or neon art require an isolator/fireman’s switch? An isolator switch is required so that if a fire occurs in the building the sign can be switched off, this stops the high voltage running down the water that is sprayed on any fire that occurs in the building. Neon is less likely than any other electrical device in a building to catch fire as they have various protections built in order to switch the sign off if a fault occurs. If artwork can be provided, please provide it as an EPS files, we however don’t require artwork as we can translate your logo or handwriting into a neon sign or neon art design for you. Artwork is always generated before we begin manufacture. I have a large artwork file, how can we send this to you? We can accept files up to 5mb in size via email if you need to send larger files please do so using a service such as we send it and include our enquiry@a1designs.co.uk email address to send it to.